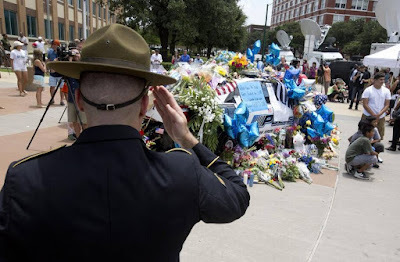 The former Army combat medic told the Star-Telegram that he wanted to show that the Dallas gunman — Micah Johnson, a former soldier — did not represent people in the armed forces. THE COLONY An Army veteran who saluted the five slain Dallas police officers for hours last summer was fatally shot by his brother in The Colony on Sunday, police said. Officers found Chandler Davis, 34, with a gunshot wound to his chest inside a home in the 5200 block of Ragan Road about 5:20 p.m., according to a news release. He was taken to Medical City Plano hospital, where he was pronounced dead.